The two preceding chapters of this book were intended to convey the knowledge necessary to begin implementing iCloud based document storage in iOS 5 based iPad applications. Having outlined the steps necessary to enable iCloud access in the chapter entitled Preparing an iOS 5 App to use iCloud Storage, and provided an overview of the UIDocument class in Managing Files using the iOS 5 UIDocument Class, the next step is to actually begin to store documents using the iCloud service. Within this chapter the iCloudStore application created in the previous chapter will be re-purposed to store a document using iCloud storage instead of the local device based file system. The assumption is also made that the project has been enabled for iCloud storage following the steps outlined in Preparing an iOS 5 App to use iCloud Storage. Applications must be associated with a provisioning profile enabled for iCloud storage. The application projects must include a suitably configured entitlements file for iCloud storage. Applications should not make unnecessary use of iCloud storage. Once a user’s initial free iCloud storage space is consumed by stored data the user will either need to delete files for purchase more space. Applications should, ideally, provide the user with the option to select which documents are to be stored in the cloud and which are to stored locally. When opening a previously created iCloud based document the application should never use an absolute path to the document. The application should instead search for the document by name in the application’s iCloud storage area and then access it using the result of the search. Documents stored using iCloud should be placed in the application’s Documents directory. This gives the user the ability to delete individual documents from the storage. Documents saved outside the Document folder can only be deleted in bulk. When creating a document for the first time it is recommended that the document be created locally first and then moved into iCloud storage. Much of the work performed in creating the local storage version of the iCloudStore application in the previous chapter will be reused in this example. The user interface, for example, remains unchanged and the implementation of the UIDocument subclass will not need to be modified. In fact, the only methods that need to be rewritten are the saveDocument and viewDidLoad methods of the view controller. Before writing any code there are a number of variables that need to be defined within the view controller’s iCloudStoreViewController.h interface file in addition to those implemented in the previous chapter. In addition to the URL of the local version of the document, it will also now be necessary to create a URL to the document location in the iCloud storage. When a document is stored on iCloud it is said to be ubiquitous since the document is accessible to the application regardless of the device on which it is running. The object used to store this URL will, therefore, be named ubiquityURL. As previously stated, when opening a stored document, an application should search for the document rather than directly access it using a stored path. An iCloud document search is performed using an NSMetaDataQuery object which needs to be declared in the interface file for the view controller, in this instance using the name metaDataQuery. Note that declaring the object locally to the method in which it is used will result in the object being released by the automatic array counting service (ARC) before it has completed the search. // File does not exist in cloud. All that remains now is to build and run the iCloudStore application on an iPad device, but first some settings on the device need to be checked. Whether or not applications are permitted to use iCloud storage on an iPad is controlled by the iCloud settings on that device. To review these settings, open the Settings application on the iPad and select the iCloud category. Scroll down the list of various iCloud related options and verify that the Documents & Data option is set to On. Test the iCloudStore app by connecting a suitably provisioned device to the development Mac OS X system, selecting it from the Xcode target menu and clicking on the Run button. Enter text into the text view and touch the Save button. In the Xcode toolbar click on Stop to exit the application followed by Run to re-launch the application. On the second launch the previously entered text will be read from the document in the cloud and displayed in the text view object. The files currently stored in a user’s iCloud account may be reviewed or deleted from the iPad Settings app. To review the currently stored documents select the iCloud option from the main screen of the Settings app. On the iCloud screen, scroll to the bottom and select the Storage & Backup option. On the resulting screen, select Manage Storage followed by the name of the application for which stored documents are to be listed (may be listed as unknown). 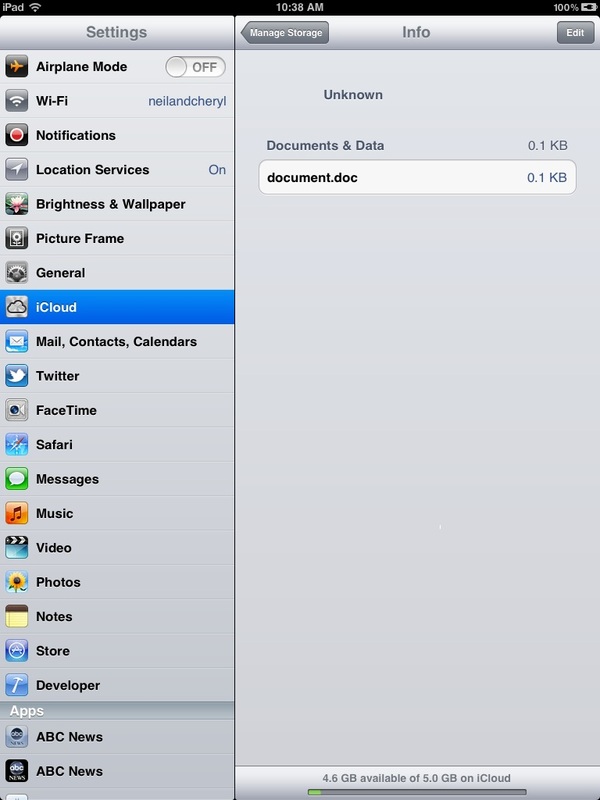 A list of documents stored using iCloud for the selected application will then appear including the current file size. To delete the document, select the Edit button located in the toolbar. All listed documents may be deleted using the Delete All button, or deleted individually. The objective of this chapter was to work through the process of developing an application that stores a document using the iCloud service. Both techniques of directly creating a file in the iCloud storage, and making an existing locally created file ubiquitous were covered. In addition, some important guidelines that should be observed when using iCloud were outlined. This page was last modified on 27 October 2016, at 20:17.